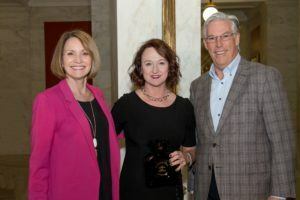 With the goal of recognizing leadership in innovation and technology-based business development in West Virginia, TechConnect West Virginia presented its Spirit of Innovation Awards on Thursday, March 16 to Allegheny Science & Technology CEO Arria Hines and software development firm Core10, during a special awards luncheon at the State Capitol. 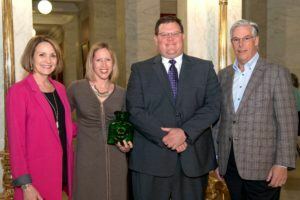 “The Spirit of Innovation program is an opportunity to spotlight success stories throughout the state, and recognize the people and organizations that support innovation-based economic development,” said Anne Barth, executive director of TechConnect. software solutions provider which opened an office in Huntington in 2016. Barth said the Spirit of Innovation Award winners represent the cream of the crop of technology innovation in West Virginia. By showcasing these creative efforts and the people behind them, TechConnect hopes to inspire others who may have similar entrepreneurial spirit. The award ceremony was part of the 2017 Innovation & Entrepreneurship Day at the State Capitol. Hosted by TechConnect and the TransTech Energy Business Development Program, the event highlights West Virginia’s science, technology, engineering and math based economy, which employs over 48,000 in the state. To view a video recap of Innovation & Entrepreneurship Day, click here. As part of the day’s events, more than 40 exhibitors representing groups throughout the state demonstrated the vibrancy of the state’s innovation economy to policy makers in the Capitol Rotunda.